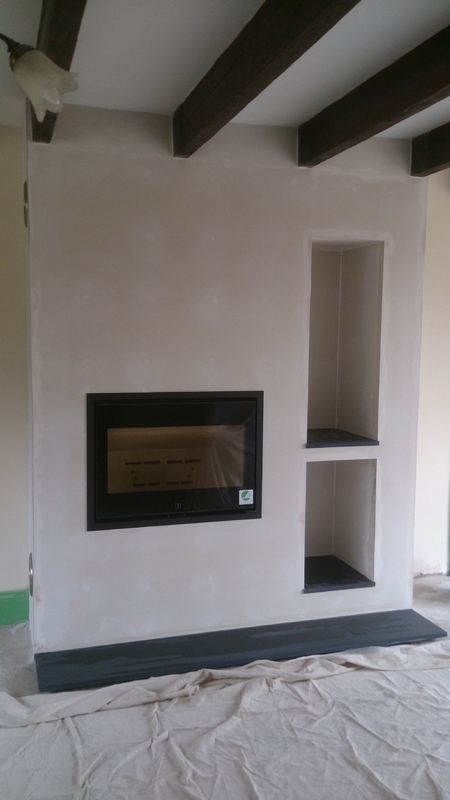 Scan 1002 woodburner in a new fireplace wood burning stove installation from Kernow Fires. The scan 1002 is a beautiful contemporary fire, here its been built into a new unit using a metal frame and fire board. Vents are built into the fireplace and because this is a bespoke unit we were able to incorporate log stores into the design. The unit is finished with honed slate hearth and smaller pieces for the bottom of the log store. The wall is finished to a smooth plaster ready for painting.